As the total final energy consumption in traffic has been increasing by 7.5 % since 1995, the total final energy consumption of the city of Stuttgart has also slightly risen by 2.5 % compared to 1995. Between 1990 and 1995, the carbon dioxide balance in traffic showed a downward trend and fell by 5 %. Between 1995 and 2000 however, carbon dioxide emissions rose again, and this by 7.5 % compared to 1995 and by 1.8 % compared to 1990. In contrast to this, carbon dioxide emissions in the energy sector remained on the same level as in 1995. This means that the reduction of carbon dioxide emissions is still on a level of 8 % compared to 1990. This result could be reached although the total final energy consumption has risen by 1.3 % since 1995. Today the final level of carbon dioxide emissions is 5 % lower than it was in 1990. But it is 2 % higher than in 1995. 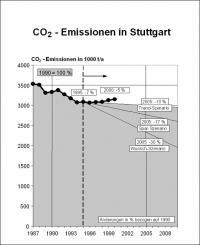 That means that the city of Stuttgart is still far from reaching the fixed climate protection goal of a 30 % reduction until 2005, even further away than five years ago. The reason for this is definitely the increase in traffic. If at least a reduction of 10 % was to be realized, the balance for 2000 would have to show a reduction of carbon dioxide emissions of 8 % compared to 1990. The measures taken by the city within the climate protection programme KLIKS during the last years helped to reduce the increase in carbon dioxide emissions. But this is not enough to react to the trend reversal in traffic which started in 1995 and to reinforce the efforts to meet the fixed goals in the energy sector. The measures which have already been taken are only responsible for a 1 % reduction of carbon dioxide emissions compared to 1990. Figure 1 shows the current development of carbon dioxide emissions in Stuttgart compared to the scenarios drawn up in KLIKS.